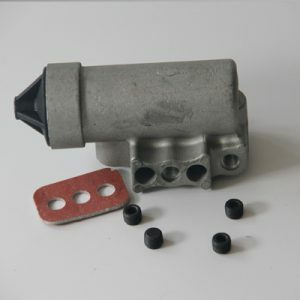 Restricted air intake – Check the compressor air filter and replace as necessary. 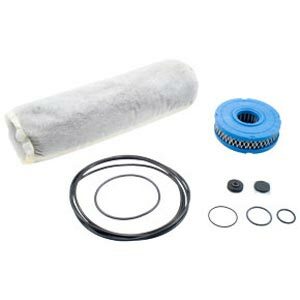 Check the compressor air intake hose for kinks, excessive bends, and a minimum ID of 5/8″. 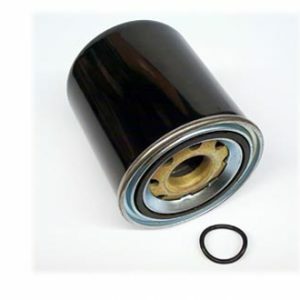 Restricted oil return – Do not use sealers on mounting gaskets as this could result in diminished oil return on some compressors. 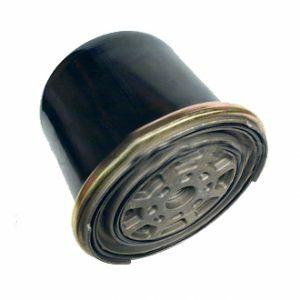 Check the bottom oil drain line on compressors that use this feature to ensure that there are no bends where oil could pool and that the minimum ID is 1/2″. 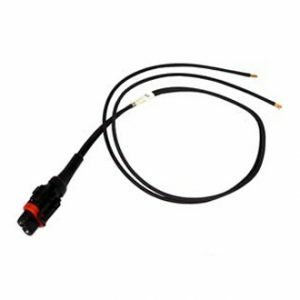 Exhaust port leakage at rest – Disconnect the delivery lines. 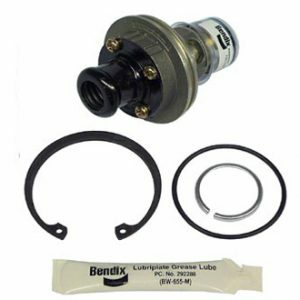 If the leak stops, inspect the device at the other end of the delivery line for leakage. 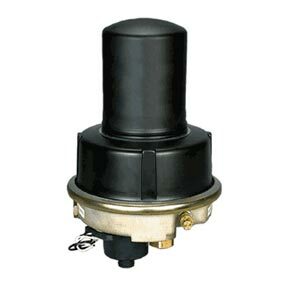 If the leakage continues, inspect and repair or replace the leaking valve. 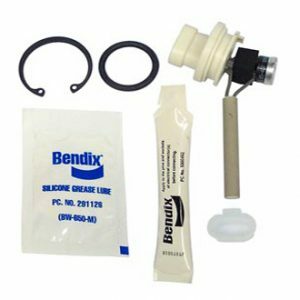 Delivery port leakage at rest – Consult the appropriate service manual for specific test procedures. 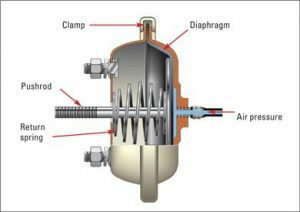 Exhaust port leakage during application – Consult the appropriate service manual for valve specific test procedures. 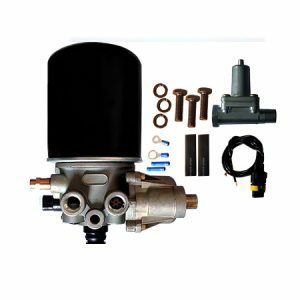 There is no application guide that tells us what air brake valves the manufacturer used on your truck or trailer. 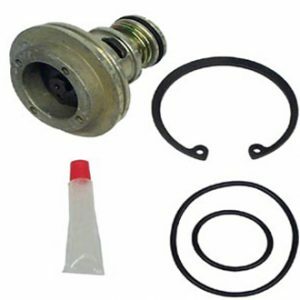 The only people who can tell you what valve the vehicle manufacturer used based on a VIN are the vehicle dealers. 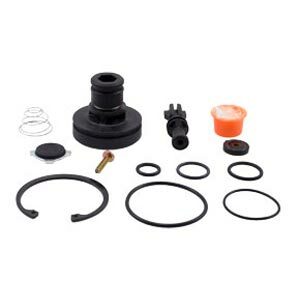 With that said, there are other ways to determine which valve you need. 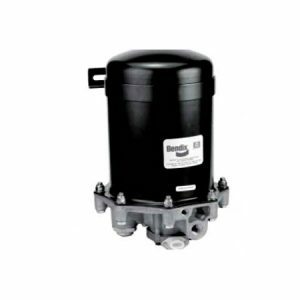 You may find a label or a metal tag on the valve that has the OEM part number printed on it. 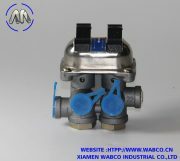 Sometimes, the number is stamped right on the valve body. Raised casting numbers are usually no help at all. You’re looking for stamped numbers here. 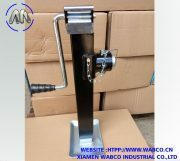 If you can’t find any numbers, you can look for a match based on the pictures we provide here on AnythingTruck.com. 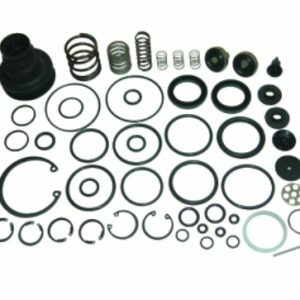 This is easiest if you know at least what type of valve you’re working with. 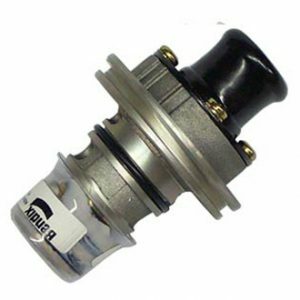 Is it a relay valve or push-pull valve? 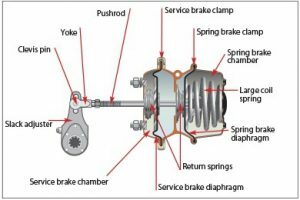 If you have no idea what kind of brake valve you’re replacing, you will probably benefit from looking over the Bendix Air Brake Handbook. 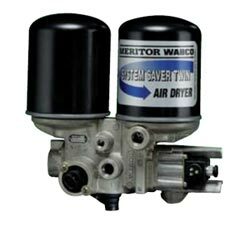 We try to provide a comprehensive cross reference lists for each air brake valve we offer here, but there are always OE numbers we haven’t learned about yet. 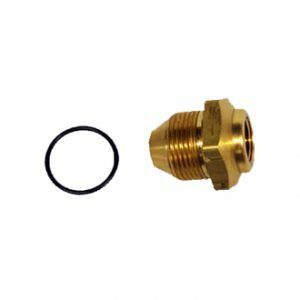 The list of pages below contains useful part number references from OE valve manufacturers. 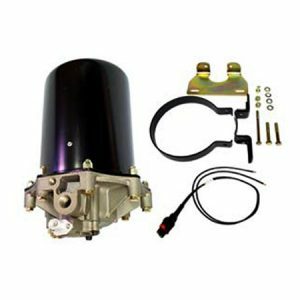 You can try your part number at the sites listed or just give us a call or drop us an email for help. 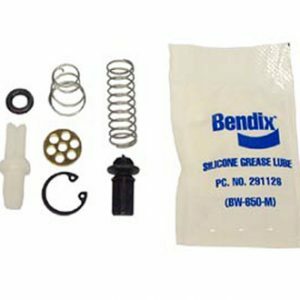 Bendix Cross Reference Cross reference a vehicle manufacturer’s part number to a Bendix number. 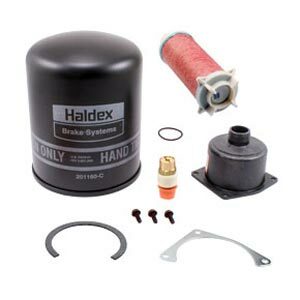 Haldex Cross Reference If Haldex made it, they should be able to cross reference for your number to the current number. Look at the right side of the page for the cross reference search box. 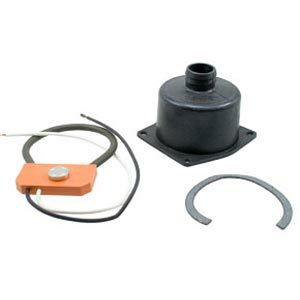 Meritor Parts Online Use the search box at the top of the page. 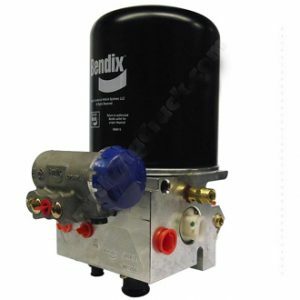 The information on this page describes how the Bendix AD-9 functions during normal operation. 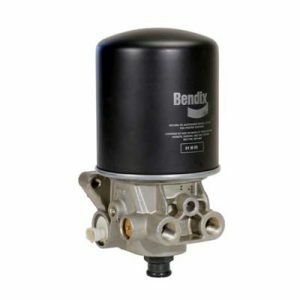 You should see our AD-9 troubleshooting information or download the Bendix AD-9 Service Data Sheet if you’re trying to diagnose a problem with your air dryer. 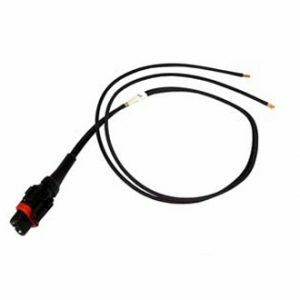 We also sell new AD-9s as well as AD-9 service parts. 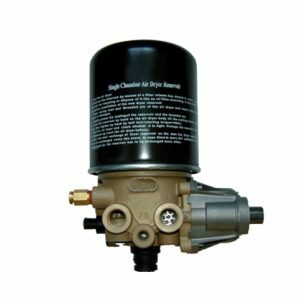 Every truck with air brakes has an air compressor on the engine. 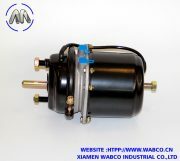 The air compressor keeps the air tanks full, so there is always air available to stop the truck. 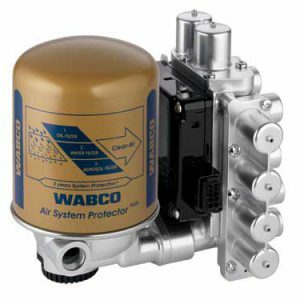 All air has a certain level of humidity which means that there is always water vapor in the atmosphere no matter if you’re in a dry or damp climate. 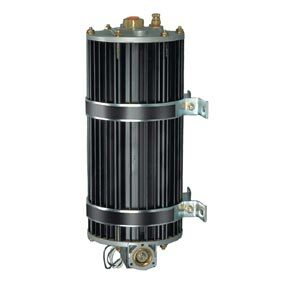 Air is heated as it’s compressed, and it cools as it travels through the discharge line to the air tank. This cooling results in condensation creating pools of water in the bottom of the truck’s air tanks. 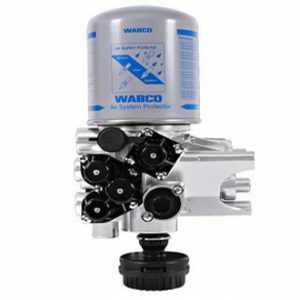 You will also find oil from the compressor and any contaminants that made it through the compressors air filter in the the water. 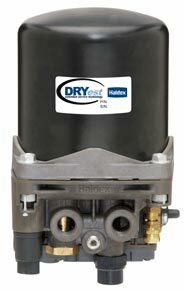 Air dryers were created to minimize the amount of moisture and other contaminants that make it to the air tanks. 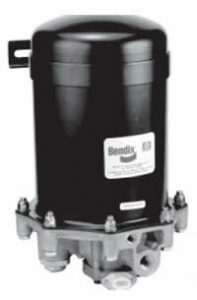 The Bendix AD-9 air dryer alternates between two modes or “cycles” during use, the charge cycle and the purge cycle. 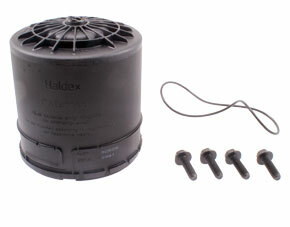 Both cycles play an important part in keeping your air tanks as clean as possible. 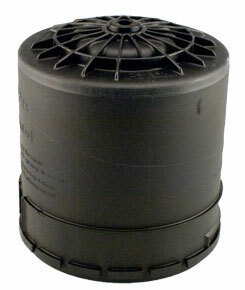 With an AD-9 air dryer installed, contaminants enter the supply port of the air dryer end cover. 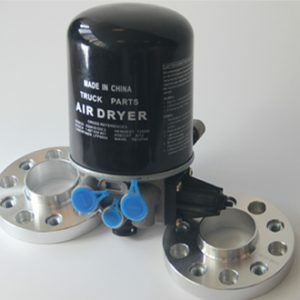 As the compressed air travels through the end cover assembly, its direction of flow changes several times causing contaminants to condense and drop to the bottom of the air dryer end cover. 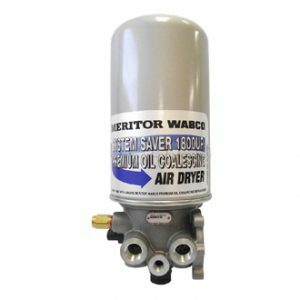 The compressed air exits the end cover and flows into the desiccant cartridge where it flows through an oil separator that removes any water as well as oil and solid contaminants. 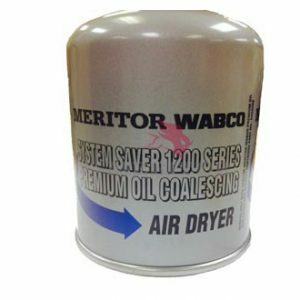 The air then leaves the oil separator and enters the desiccant drying column. The moist air flowing through the column of desiccant becomes progressively drier as the water vapor absorbs into the desiccant material. 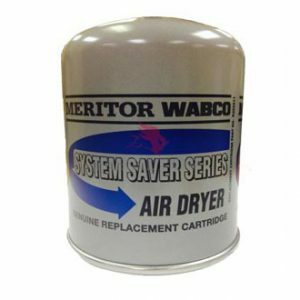 The desiccant cartridge removes 95% of the water vapor from the pressurized air. 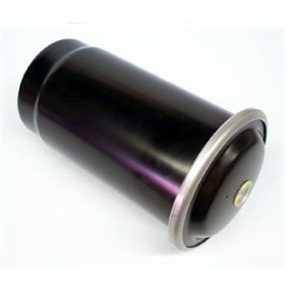 between the desiccant cartridge and outer shell. 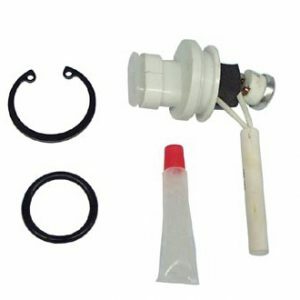 Some air exits the desiccant cartridge through the purge orifice near the check valve. 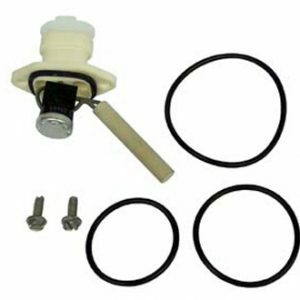 The dry air is then moved out of the purge volume through the single check valve and out the delivery port to the first (supply) reservoir of the air system. 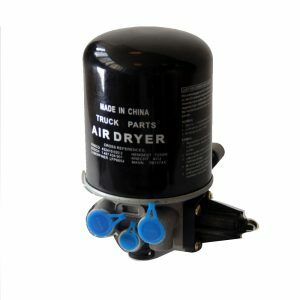 The air dryer stays in the charge cycle until the air brake system pressure reaches the governor cutout setting. 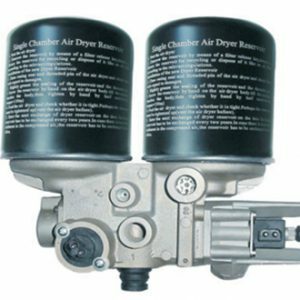 The purge cycle of the air dryer begins when the governor causes the compressor to unload (stop compressing air). 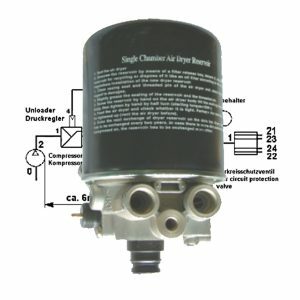 During compressor unload, the line connecting the governor unloader port to the AD-9 air dryer end cover control port is pressurized. 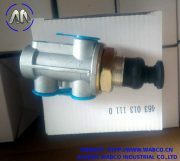 The air pressure causes the air dryer purge valve to open. 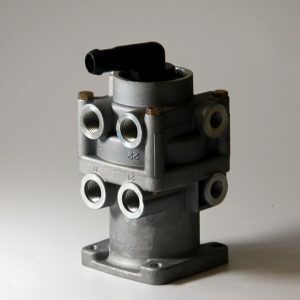 Contaminants in the end cover sump are expelled immediately when the purge valve opens. 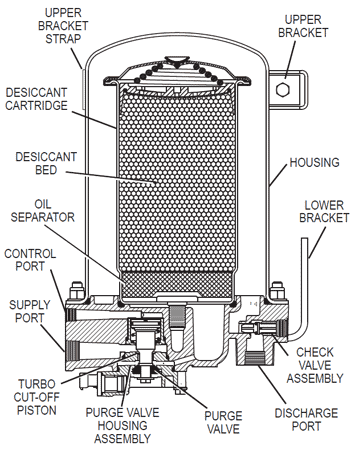 At the same time, the air that was traveling through the desiccant cartridge reverses direction and begins to flow to the open purge valve removing oil and solid contaminants collected by the oil separator. 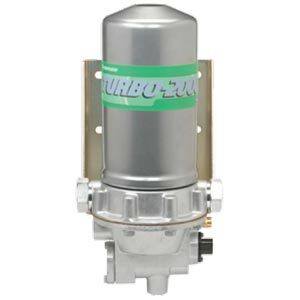 The initial purge and desiccant cartridge decompression happens in just a few seconds and is evidenced by a burst of air at the AD-9 air dryer exhaust. 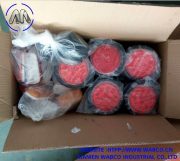 The flow of dry air through the desiccant cartridge drying bed reactivates the desiccant material by removing the water vapor it previously absorbed. It normally takes 15-30 seconds for the entire purge volume to flow through the desiccant drying bed. 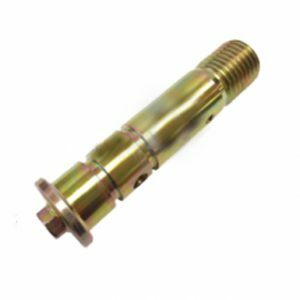 The single check valve in the AD-9 end cover keeps air pressure in the brake system from blowing back into the air dryer during the purge cycle. 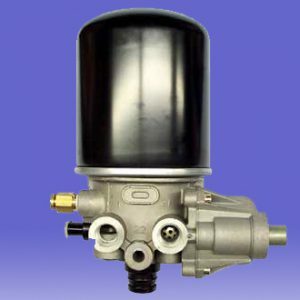 The purge valve will not close until air brake system pressure is reduced and the governor signals the compressor to begin compressing air again. That will start the next charge cycle.